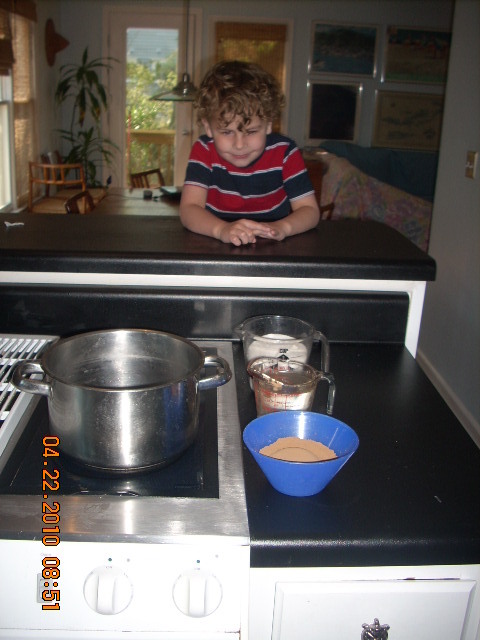 In April 2010 I first posted about making, from scratch, chocolate syrup. Wow 2010, it is not 2013 and I have been making chocolate syrup about weekly, or more often, ever since. It is the only chocolate syrup my boys will accept now. 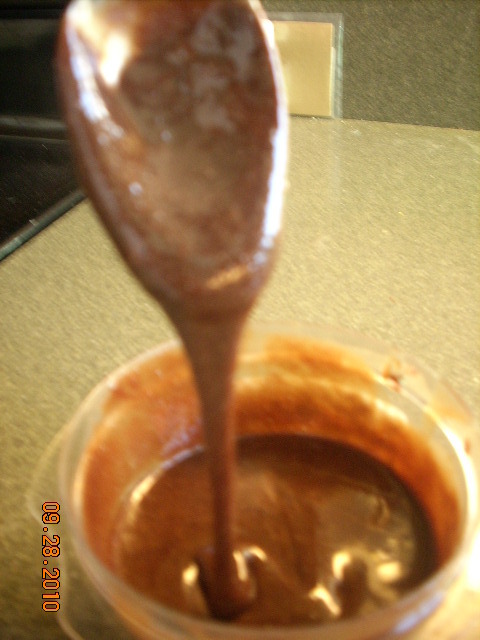 I have tried several varieties (like https://scribinglife.wordpress.com/2010/09/28/a-different-approach-to-chocolate-syrup/) . I need to try more; I’d to prefect the addition of protein power to the mix. Today I wanted to post just things I have learned. I generally make a double batch each time I make it. Mix the cocoa powder and the water in a saucepan. The cocoa power will not dissolve until the water warms up. Next add the sugar, and stir to dissolve. Boil for 3 minutes over medium heat. Be very careful. After you remove from the heat, add vanilla. The original recipe I used noted that in the refridator the syrup will last for a couple of months; but I sure would not know, as I said I make a batch at least once a week or more. You have to adjust boiling time based on weather and your location. The first batch I made here on the east coast; I boiled it 3 minutes like normal, poured it in our dispenser bottle, and it promptly turned to fudge. So I learned that, while we are here on the cost, as opposed to living in Middle America, I need to boil the mix less. I freely admit I am envious of all the mothers out who worry about getting a few more veggies in their kids, while I struggle with getting food in mine. I have always been jealous of the “I add cauliflower to mashed potatoes to get more veggies in my kids”. Frankly, I’d be happy to get a full serving of mashed potatoes in mine. So I have not really ever had success with the whole “sneaky chef” style of cooking to expand my son’s diet. He generally refuses muffins, doesn’t dip food in anything, and won’t eat sauces and so on. Now, however I have my “sneaky chef” moment to report and I am kind of excited about it. I make the chocolate syrup that we use for the boys hot cocoa (and I am happy to report that Almond milk, with chocolate syrup is just as good). I have been doing this since 2010. Once before I tried to alter it to provide a few nutrients in addition to simply pleasure. That attempted didn’t really work out. Now, however, I have finally – though trial and error – gotten a recipe worked out that allows for me to ‘hide’ protein in their chocolate syrup. I have been using Peaceful Planet Inca Meal; it is rice protein. The reason I chose it? I had it in the cabinet. I am not sure it is the best, non-daily, non-soy protein powder out there; I need to do some more research. I had, before this, a pea and bean power; I may look for that again. The point is to provide, mainly Big Brother, no matter how small the amount, additional protein and also a different protein than he is getting otherwise. Originally I started with this recipe. I have grown from there. Dissolve the cocoa first then the protein power; add sugar and bring to a boil. STIR CONSTANTLY. For some reason, adding the portioned power makes it much more likely to burn to the bottom and that is a mess like you have never seen before. The additional sugar is necessary, in my opinion, to cover an after taste; I did the first (smaller) batch with out increasing the sugar – just adding the protein power to the regular proportioned recipe and the boys said it tasted funny, I agreed it was a bit tart. Other’s might now feel that way and could cut the sugar back to 4 cups. My boys have accepted it without noting any difference. We are ½ though our 2nd batch and I have not had them say a thing about it being different. I am excited today to have my dear buddy, and fellow SN parent, Rebecca Hunter posting for me about. Rebecca has a lot more expeince than I do in the kitchen. I have been trying to get a blog of her for a time and glad to finally have it done. After several of Aimee’s recent Facebook posts and my own family’s food restriction issues, I bought a set of all-natural plant-based food colorings from IndiaTree via Amazon.com and told her I would view this product for her and all of you. A little background: I am a 35 year old special needs mom of 3 kiddos, living in rural South Dakota. My oldest son, Charlie (8 years), has Autism and Leaky Gut Syndrome. Because he is highly addicted (yes, like a drug addict) to Gluten (wheat protein) and Casein (milk protein) we have him on a totally Gluten-Free/Casein-Free Diet. He has been on this diet for approx. 14 months and has been “clean & sober” since last Feb. We can always tell when he’s gotten hold of something he’s not supposed to eat, because he begins exhibiting severe withdrawal symptoms within 3 hours of ingestion of prohibited foods. He also reacts with hyperactivity to FD&C red, orange and yellow dyes. My 6 year old son, Henry, has as yet undiagnosed (ADD /ADHD???). 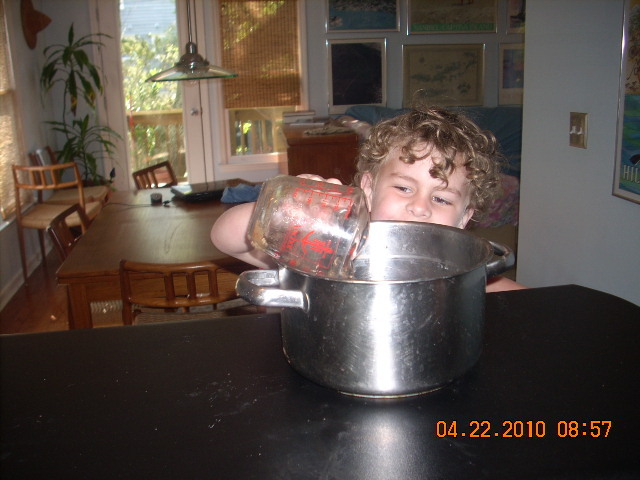 Henry reacts even more severely to food coloring, the entire spectrum including Carmel color results in not only severe hyperactivity, but also oppositional- defiance behaviors. My youngest, almost 4 month old Anna is allergic to milk protein. Thus as a family we are experiencing some fairly drastic food limitations. This year is the first year I’ve felt brave enough to do much in the way of holiday baking, which for me seems strange as I am normally very accomplished in this area. I first began decorating cakes/cookies at the age of 5 years when my mom took a Wilton Cake Decorating class and let me practice with her. I’ve been using these skills for over 30 years, self-taught in the more advanced parts of the Wilton Method of Pastry Arts and have been occasionally doing professional cakes for others since about the age of 15. In 2002, I even baked & decorated my own wedding cake. After that experience, I went online to Amazon and bought a set of the India-Tree all natural plant based food coloring (set of 3 “red” , yellow and “blue”). When they FINALLY arrived via the mail (really the shipping was fairly prompt… no issues there…. The kids (and me too) were just chomping at the bit to play with this stuff!) 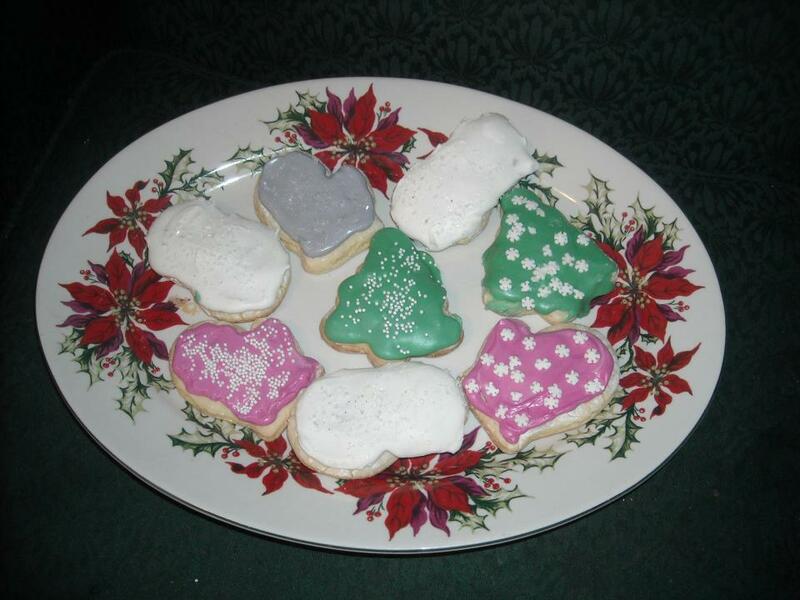 and the baby was down for her evening nap, I whipped up a large batch of poured cookie icing (aka ColorFlow icing)… this is just a Royal Icing (water, powdered sugar, meringue powder, vanilla) to which I add a little light corn syrup. (I’ve not tried doing this icing for those w/ egg or corn sensitivity yet, but if that is a problem one could experiment with egg replacer powder and maple or agave syrup.) 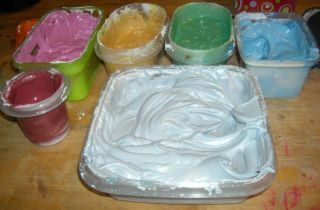 This icing is very “white” in color, so it takes quite a lot of coloring to tint it, especially in vibrant colors compared with a butter/shortening based icing. We proceeded to try out our IndiaTree food coloring. Overall I got the approximate results I was expecting after my years of cake decorating and my work in the last few years with using natural dyes on my llama wool and in mineral cosmetics. The India Tree “red” food coloring is made from beets (if you’ve cooked beet you’ll know they turn everything they touch a pretty reddish pink), so I got the “Barbie pink” I was sort of expecting using the red dye at 30 drops in 2 cups of icing (I chose not to “waste” these rather expensive food colorings attempting to make this darker… who says mittens have to be red-red anyway, right?) The yellow dye is made with cumin and tends to separate in the bottle… you really have to shake it up to emulsify this one to get an even color. It did not take much to get a pretty yellow (10-15 drops in about a cup to cup & half of icing for a nice lemon yellow and a little less for butter yellow). On the far right was our attempts using the blue which is made from red cabbage (this is about 35-40 drops of the “blue” in 1 ½ cups of icing) obviously it is not really a “blue”, but we got a really pretty pale lavender with it…lovely on it’s on but it wasn’t what Henry was really wanting for snowflake cookies which he saw in a magazine I had. In the picture our “green” looks a little more olive than it did in person. I was quite disappointed with using this set to make green (you may or may not have the same result… I had another way to get where I wanted to go, but I’ll talk about this more in depth in a bit, I didn‘t want to use up the entire set in one night trying to get this one to green, as we have some birthdays and Valentines around the corner). The attempt at green that we had resulting in icing in the grayish-yellow color you’d typically find on the outside of a boiled egg yolk… not really where we wanted to go for Christmas Tree and Wreath cookies… but then again after using Wilton’s Food Coloring Gels for 30 years, my standards are extremely high… I’m quite used to being able to take a paint chip sample and being table to match it with icing to an almost exact match. In reviewing this product for you all, I’d have to say that if you have little girls or want to use this for cookies, cakes and cupcakes or whatever in the warm color spectrum from yellow , orange, pink-red, pink or purples, you’ll be really happy with the 3 color natural food coloring set from India tree. If you have boys who aren’t into pink/purple or want cool colors of blue and green or need Christmas red-red, black or brown (or some more unusual colors like gold or silver) look for another way to get there in advance of your baking project. And now for the alternate method of how I got where I wanted this project of baking GF/Dye Free Christmas Cookies for the Kindergarten and 2nd grade Christmas Parties today to go. Being too frugal to throw out our “frosting mistakes”, we used another type of product we had on hand (which most people probably don’t have in their pantry unless they also make their own mineral makeup) to tweak our “mistakes” into something we could use. In my home-business I make goat’s milk bath/body products and also make handmade mineral makeup… so guess what groovy product I have a lot of on-hand? If you guessed Lip-Safe (aka edible) colored mica/mineral pigment powders, you are correct. In years past, when I lived in Independence, MO as a teen/college student, we had a Cake Decorating Shop that carried food-grade mica and mineral pigments for this use, so I put 2+2 together and got 4. I buy all my mica powders for making makeup from TKB Trading in California ( www.tkbtrading.com) and am friendly with the owner of this business having met Kalia at the Falls Park Farmers Market (Sioux Falls, SD) in 2010 when she was visiting for her nephew’s wedding. Typically lip-safe micas are used in lipstick/lip balms as well as foundation, blush, eye-shadow etc. TKB Trading carries hundreds of these colored pigments. Just be careful in ordering that they are all lip-safe colors if you will use them for baking/food uses and it really doesn’t take very much mica to get a nice result. It is usually sold by the ounce and there are quite a few teaspoons of product in an ounce of mica. Please be careful to check the additional info link on each mica color before ordering (especially the greens & blues) to verify they are lip-safe and therefore edible, as many of the purples, blues and greens are NOT LIP-SAFE because some of them contain ultramarines and/or chromium greed dioxide (these are eye, face, nail safe in makeup/nail polish, but NOT FOR LIPS/EDIBLE). The pink we got with the India Tree dye on the left in the green container was o lovely we left it alone. Most of the other colors (except our “green” which that gray-yellow was pretty scary looking… let‘s just say it was off putting enough you didn‘t want to eat it, especially if you still have a baby in diapers!) were pretty enough if they’d been what we were working for, but we really wanted something a little more vibrant, so we tweaked them to get where we wanted to go. Christmas Tree Green icing = (20 drops India Tree yellow + 30 drops India Tree blue = grey-yellow “green”) + 2 tsp TKB Trading’s “Green Apple Pop” mica (lip-safe green) + 1 tsp TKB Trading “Blueberry Pop” mica (lip-safe blue) Please note: I think you could skip the India Tree color in this one, use just a bit more mica and get a similar result. Silver Icing= 2 cups icing (w 30 drops India Tree blue) + 2 to 3 tsp. TKB’s Polished Silver mica + 1 tsp TKB’s Pearl Basics mica. One of the nicest things I found in my experiment of using my mica powders to tint icing was that in Royal Icing or Colorflow cookie icing we got a slight shimmering finish because the mica itself reflects light, so you can get “metallic” and satiny finishes with this method of coloring. Many of you know that as a family, and for Big Brother, we make every effort to maintain a restricted food plan. On professional advice we are following the Feingold diet. This is a decisions we made back in April, and we are seeing a big difference in Big Brother; the difference is not complete but the food plan seems to really take things down a notch so that Big Brother is much better able to learn skills he needs and to participate in effort to help him with the challenges he faces. You may also know that we do “cheat” in order to balance the food plan with products available to us and also to Big Brother self-limiting eating style. We are very very strict about the “Big Three”: artificial colors, sugars and preservatives. We are equally observant regarding apples as we have seen a real reaction to them. We cheat more on things like berries; he consumes very little of them, so they are mainly flavors in a lemonade or something. Getting new and different foods into Big Brother is an on going challenge to. He has a true panic reaction to any new food; and even more of one to any food that doesn’t fit his “criteria”. (he also panics about being at a table full of people to eat, but that is another issue) I worry less about AMOUNT as I feel I should trust his body to say “full” just like I would trust him nursing. I don’t need a lot of food; it is realistic that he doesn’t either. As long as he is not “playing full” to avoid eating at all, I am willing to respect his body’s signals; I have no intent to go from “eats too little” to “over eats”; I am not trading one eating issue for another. Nevertheless he DOES need the basic nutrition and a variety of food and more importantly he needs to be able to eat at a table and eat a semblance of a common food collection so he can function as a teen and an adult and not be limited in life by his food issues. We recently tried YoBaby Meals by Stonybrook at the suggestion of a brilliant and understanding momma friend. They are a hit. We have tried all 3 versions now and I have got him to eat them all. Granted I have to spoon feed him, and even bribe him or play games (how many spoons do you think it will take it get to the half way point?”). Part of the problem is they are not thick at all; they are soupy and do not stay on the spoon. They surely would be a great frustration to Big Brother to self feed (if he had the interest, he does not). The three choices are: apple & sweet potato, pear & green beans, and peach & squash. I have tied, before now, mixing veggie baby food in yogurt on myself, since SMOOTH yogurt is something Big eats decently — but never got it creamy or smooth enough. This is really a good thing. These are not perfectly smooth and that is an on going issue, bite after bite, but if I am able to keep up the speed, we get it all eaten. They are 4 oz containers, the first one we tried was Peaches and Squash — I do not think he has consumed squash since 18 months 🙂 ; so I was so happy when he ate all 4 ozs without a fight or panic. It was not a slam dunk and took a lot of effort, but he got all 4 oz and no tears. (Peaches or on his no-no list, but I gotta work with what I got — only one of the 3 is a fruit he really should have). The other baby version (YoBaby) is yogurt and cereal, not that big a deal to me, and the toddler yogurt is just fruit and yogurt, not a biggie, I can get that other places — but all the 3-in-1 meals have a VEGGIE and that is a brilliant idea. The baby version with cereal and IRON is one I am thinking about also, but I am excited about the VEGGIE option. I did leave a comment for the company on their official site saying they need more than 3 veggies — i suggested carrot and pea. I suggest EVEYONE go leave a comment, and suggest other veggies that would work well. In reality I’d love to be able to mix puree of veggie and plain (or vanilla) yogurt myself to get more options; and also so I could slowly increase the amount of veggies — but again the times i have tried have been FAILS!! I have tried 4 or 5 times that I can think of; once it was ok the first day – peas and plain yogurt and put in the freezer for a time, and he ate about 3 oz of that, but it was a one time thing – never again. I can not get smooth and creamy enough. The peach and squash meal seems to continue to be the favorite, and pears and green beans come in last. (You can’t tell him the pear one is pears, he has decided he doesn’t like them and will panic at the suggestion he eat them). Long ago when Big Brother was a “young toddler” (say 13 to 18 months) he loved squash (all of them) and also avocado; not that I can get him to even think about eating them now. Actually, I kind of am torn about feeding apples to Big Brother at all. We are strictly non-apple here and he does seem to reach to apples, more so to apple juice but to the apples too. But there are only three options and three veggies to choose from, so I got a four pack to try. Yesterday I really went out on a limb and tried mixing some protein power with the ‘meal’. I choose the apple and sweet potato one to experiment with. The protein power I used was Peaceful Planet Inca Meal. It is a non-soy vegan product and while we are far far far from vegan, I like to use ‘their’ products as I know it is a collection of proteins Big Brother (or the rest of us) do not generally encounter or get enough of. No whey protein, since we all drink milk, that is a protein we get enough of and I do not like to use as a protein supplement. It is an easy way (choosing non-soy vegan) to get a different protein into Big Brother to help with the diversity of foods / proteins which is one of my biggest concerns about him. This is just an easy “cheating” way for momma not to have to struggle to read labels. 🙂 Vegan = non-whey and I look for vegan non-soy and I am sure to get pea and bean protein (among others). Makes it easy on me. So I started with a 4 oz contained of apples and sweet potato yogurt (3 grams of protein) and added 1/3 of a scoop on protein power (15 grams of protein for a scoop = 5 grams for the 1/3 I put in). I stirred and stirred: remember SMOOTH is very important, lumps cause panic. Then we played “feed the puppy his food” and I spoon feed the meal to Big Brother. He was a little less happy than other times, and momma has to think a lot to keep him opening his mouth and not get into a fight / power struggle and not to push him too far, but we did it. He ate all 4 oz so 8 grams of protein. Again it was still way too soupy and thin for him to be able to self-feed at this point. He eats thick creamy yogurt fairly well all on his own; but the YoBaby Meals are just no where near thick / creamy enough. So I plan to try the protein power in the Meal again. I’d like to add more, but that fills the container and Big Brother has a real thing about eating it right out of the original container doesn’t eat it as well if I pour it in a bowl (maybe he doesn’t trust me not to monkey with it :)). I am also thinking of adding some Knox Gelatin to make it thinker and creamier, I know he’d like that better. Finally I have been inspired to try to make my own yogurt and veggie mix again SMILE and see how that goes. I think I will try in the blender and then freezer for a couple of hours. Always looking for more food options. This guest post is by my oldest and dearest friend, the sister god granted me. We no longer admit how long we’ve been friends, but the only two people I have known longer are my parents. The Mom Butler she speaks of was the dearest woman ever, and I am truly sorry she did not live long enough to see Pamela and I mother. First allow me to introduce myself. I am Pamela Pour one of Aimee’s first friends. I am a mother of two darling children (M 7.5 G 3.5) and the hardest working husband ever (B). I feel I should tell you a little about myself, but where to begin. Having always had one foot “outside the box”, I have often found myself along the path less traveled. My passions include (in no particular order) natural parenting, natural child birth, extended breastfeeding, co sleeping, Waldorf and Montessori inspired learning, organic lifestyle, art, photography, Jo Charles Foundation, and nourishing the body. Oddly, one of the largest focuses in my life has indeed become “nourishing my children’s bodies”. Having had an interest in cooking and baking since I stood on a small white chair in Mom Butlers’ kitchen learning to crack eggs at the tender age of 4, the topic of food comes easily into my world. I was baking casseroles by age 13 and had dinner on the table for the whole family by age 15. Having never been much of a soda drinker or fast food eater, I began to learn even more about healthier eating in college and became interested in Organic Produce. In 2000 I lived in Japan and learned about the CSA (community supported agriculture) movement, and quickly joined Maple Creek Farm in Yale, MI when I moved back to the US. This is where my education in the “food” arena quickly matured. Growing up my sister had an allergy to milk, so I was used to seeing a little of food caution. But she wasn’t strict about it by any means. I met people with Celiac Disease and Food Allergies as well as people with other food concerns. I met awesome Farmers with a passion for the best quality food. When I became pregnant for the first time I started researching breastfeeding, baby food, vaccines, and alternative support for a healthy child. I also met a spectacular child birth educator (Bradley teacher) who had children with food allergies. Little did I know how valuable her information would become to me. After the most spiritual and empowering natural birth of our first child (M) I quickly began pulling from resources I had discovered since living in Japan. At about 10 weeks of age, I noticed a rash on M, and within a few days it grew to cover his whole body. He looked like he had measles. Remembering some of what my Bradley teacher had taught me about food allergies I quickly made changes to my diet (no eggs, no wheat, no milk, and no fish). I saw some small differences in our son, but not enough. After nearly 12 months of struggling with traditional western doctors (2 pediatricians, 3 dermatologists, 2 pediatric allergists, and even a chiropractor) our son still looked like a burn victim and still screamed till 4am, and still scratched himself until bloody every single night. We changed sheets every morning, and stain removal became a morning routine for all of our pajamas. 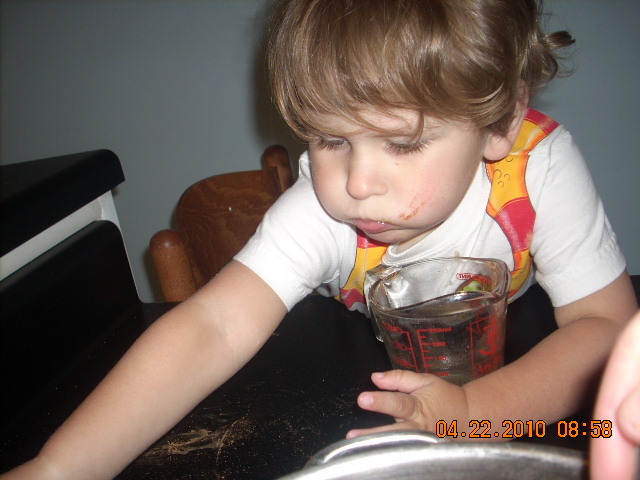 M was covered in bloody oozy eczema; he was having a lot of diarrhea, and frequent vomiting. He was starting to eat solids and I was at a loss as to how to nourish him (besides the breast milk). Finally I called that Bradley instructor and she referred me to the best Pediatric Allergist ever. He worked with me breastfeeding my 13 month old son, created a rotation diet for us both, recommended supplements like: zinc, acidophilus, evening primrose, fish oil, flax oil and more – recommended fragrance free soaps, lotions, laundry detergents etc. Finally my son began to heal. From the inside out! From there we implemented some NAET treatments (and wow!). As M began to eat more and more food, beyond “baby food” it became more and more of a challenge to feed him food he would eat, but that retained some nutritional value. I lived in terror of him becoming that bloody oozing child all over again with each bite of something new. I struggled everyday searching to find answers. I realized he liked some “brown gravy” once (made with cornstarch) so we began making “Green Gravy” where we made a gravy using chicken stock and broccoli etc for Mason to dip chips or GF bread into (now we are corn free so no chips and no cornstarch). We made Sour cream and spinach dip with carrots. We noticed he tended towards foods that crunched, but not raw carrots. So we began making thinly sliced carrots, sweet potatoes, Yukon potatoes, even whole Kale leaves and baked them at a low temp brushed with olive oil, drying them but not baking out all the nutrients. He loved them! We dehydrated blue berries and apples, because he liked it better than fresh, and well it was healthier than chips and bacon! Pizza for us was a slice of GF bread smeared with a pesto like sauce (Nut Free: Broccoli, butter, Olive Oil and basil) sprinkled with finely chopped turkey and cheese on top and baked. Everyday presented a new challenge. His tastes changed, his habits changed, his symptoms changed. But he got better! So now you know the main reason for my passion for food and nourishing children. I pull from traditional recipes we all eat but I convert them to make them safe for my son. I also pull from other allergy friendly recipes but make them taste better, or make them more nutritious. I am a scientist, learning what can be combined and what cannot. What makes it taste better, or makes it taste worse. What makes it something my children would even consider tasting. Each child is so different. And each child has different nutritional needs. Children with Celiac Disease must remain 100% gluten free, Children with Seizure Disorders are often put on Ketogenic Diets to reduce or eliminate chronic seizures, children with Autism are often put on Gluten free and Casine free diets to help them manage everyday life, children with ADD ADHD are often put on diets free of specific dyes, chemicals and natural occurring elements which have been increasing their hyper activity. And children with extreme or multiple food allergies must follow a diet which best suits their body and helps them achieve overall wellness. Now we are living in China for DH’s job. It’s a new food and nutrition challenge that’s for sure. The quality of food and lack of knowledge on “safe” food is a daily struggle. 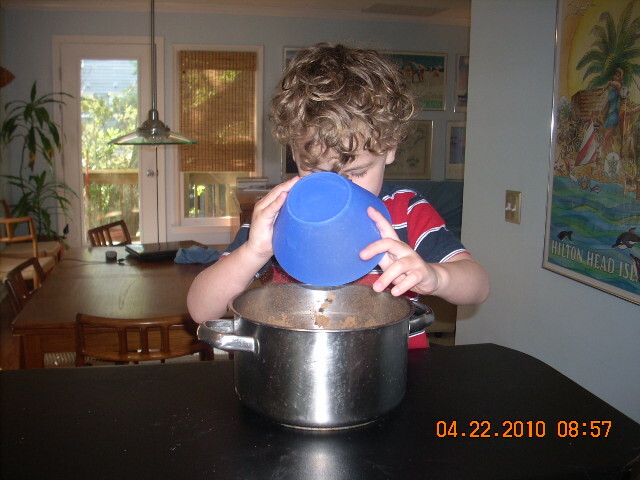 There are no “truth in labeling” laws, restaurant servers lie about ingredient to make a sale, cross contamination is very common, and eating out as a family requires me to prepare an entire meal to pack for our son before we leave the house. Although this is a practice I have become accustomed to since he was very young in the US. But when I am lax, our son is sick. So the extra time is well worth my efforts! Yes packing lunches and dinners out are difficult and time consuming. Yes making rotation diet menus are difficult. Yes making special cupcakes to take to birthday parties is difficult. Telling him he can’t eat something other kids are eating is extremely difficult. Keeping track of symptoms (moodiness, sleep habits, rashes, athlete’s foot, red ears, crying, fevers, stomach cramps, constipation, diarrhea, etc) is also very difficult. But the most difficult thing for me is the lack of understanding and support of supposed “loved ones” and family. I have become numb to the “ohhh one bite won’t hurt him!” and the “Come to Grandma. Grandma give you a cookie sweetheart.” Why is it that, a child unable to eat a “regular” sugar/hydrogenated oil/egg/gluten filled cookie provokes sadness and tears (from family not from the child!). But the same child covered in a bleeding oozing rash, having diarrhea, crying and unable to sleep does not? Sad but true. This is a topic I could write about for hours and hours. You would surely walk away exhausted (if you are not already). But what I will leave you with is this: No matter what your child’s likes and dislikes are, no matter their health condition – do your best to vary their food intake – help them learn to “step outside the kid food box”. Do it now while they are young. Teach them that Peanut Butter Sandwiches or Pizza everyday is boring and not healthy. Engage them, involve them in the preparation of foods they can eat and in choosing today’s menu. Take them to a farm; take them to a farmers market. Teach them about other children’s special food needs – be it allergy or otherwise. Teach them that we all have special food needs (one of them being trying new things!). There is nothing worse than feeling like there is something wrong with you because you cannot eat what the other kids are eating at the school lunch table. The foods I prepare for our son are: Wheat Free, Gluten Free, Egg Free, Nut Free, Corn Free, Soy Free, Peanut Free and often Yeast free (except the Pizza crust). We keep tomato to a minimum because it causes inflammation. Most baked items are also Dairy Free as our daughter is allergic to Cow’s Milk. So I actually EXPERIMENTED in the kitchen with a “cooking related thing” last night. Be amazed, be very amazed. My kitchen confidence level is so low it could be negative so this is a huge deal. Furthermore no fire and the product is usable if not perfect. Big Brother is very self-limiting in his food consumption. I do my best to respect his desires about food while at the same time trying to expand his collection. I DO truly desire for him to eat more variety, but I am well aware of the dangers of food struggles. As long as he is healthy, gaining weight (though I am not sure how) and otherwise fine, I choose to keep the food fights low level. Also Daddy and I struggle with the idea of demanding a child eat if they don’t want to; we both feel – especially in this nation of eating disorders and obesity – to teach our children to listen to their bodies and not to eat because of a clock or to eat everything because it is there. So if Big Brother is not hungry, I feel to a good extent we should respect his body, just as we did breastfeeding – allow him to say if he is hungry or not rather than forcing expectations on him. I’d love to be able to sneak more ‘good stuff’ into his foods, but most of his acceptable foods do not give that option. How I wish he’d eat muffins or pancakes or something, but not yet. Frankly last time we make home made cookies at his request, he helped, he ate ½ of one cookie and that vas all, for the entire batch. One on going concern of mine is protein. A variety of protein might be a better term, he gets enough protein but it is all whey – milk and some yogurt (no cheese). Occasionally he eats chicken in nugget form (Tyson dino nuggets often) but then, maybe 1 or 2 nuggets so that is a small amount of protein. Occasionally he eats crunchy fish sticks, but again he consumes so few that the protein count can’t be that high. No meat, way back when he was just starting food, and was like 14 or 15 months he’d eat as much browned venison as I offered; then he stopped. I do not think he has ever eaten beef or pork. No fish that is not in crunchy stick form, and well breaded to make it crunchy. He does drink milk, ‘hot cocoa’ – basically chocolate milk heated up. He doesn’t like white milk, though he used to, and frankly I have bigger fish to fry at the moment that a battle of wills over milk. Besides, chocolate has more calories, and that is not a bad thing for him. Many have suggested removing his milk, for various reasons. I admit his doctor / nutritionist, who I truly respect and value, has suggested it. The reason I don’t? Simple really. I am afraid to. I know he has the capacity for starving himself, I know his emotional challenges get worse without enough food, and honestly I am afraid to go down that road. Sad, but true. I am afraid he’d just not consume anything; and I am afraid that THAT would snowball downhill and make everything else about his challenges just that much harder to deal with, on a minute to minute bases. My biggest fear is he’d end up sick or in the hospital due to it and then I’d loose control of his ‘care” and he’d be force fed and all the unkind “get the kid to eat” methods I refuse would come in to play, then, I’d have real issues to deal with for the rest of his life and quite possible a real eating disorder or more emotional issues than we have now. Ok, so I may have to “go there” some time, but not now. So since we are following the Feingold diet (http://www.feingold.org/) I make real chocolate syrup / sauce for making him hot cocoa or putting on ice cream. At the health food store I bought: Organic Inca Meal Rice Protein (Peaceful Planet brand). It is a non-soy vegan protein power. The raw organic fruit complex DOES include berries, and Big Brother is not supposed to have that. But, sighhhh, I didn’t see that till I bought it. (I never said this diet was easy). So I am going to go on and try it – then next time I will have to be more careful. I see now on the store site they have a vegetable non-soy protine power, so many next time I should try that. Here is the experiment. Don’t laugh. The protein power is very light and powdery like a powered sugar. So I tried adding some of it to the chocolate syrup as I made it. Hey it was worth a shot. I warmed the water and dissolved the coco in it, like normal, then added the protein power. Then as that dissolved I added the sugar. I split the pot them, part I re moved and did not boil and the other ½ I boiled as normal. Ok – so success or fail? NOT FAIL. I am fairly happy with it, and it is usable – that is what matters. I am hesitant to call it a clear success – but I am happy with it for a first try. The ½ that I did not boil is not 100% smooth, but dissolves into “warm milk” if warmed – but not when cold. So my chocolate milk is a bust, but his hot cocoa was fine. Also this syrup will go in the pour spout bottle I use for our chocolate syrupy. Not as smooth as normal but basically the same. Big Brother didn’t notice. He drank all of the 4 oz I gave him immediately. 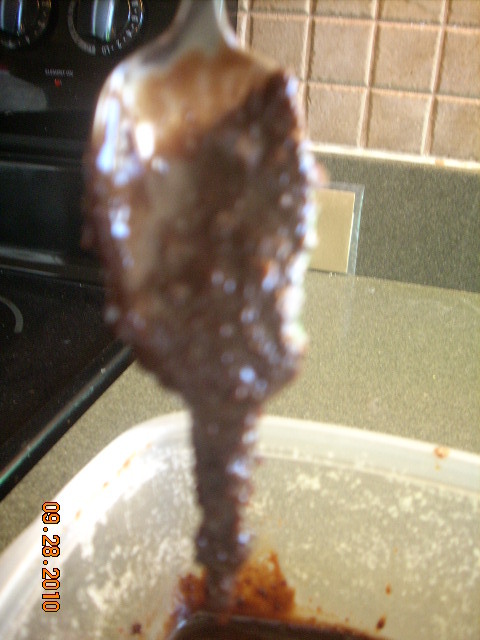 The ½ that I did boil really thicken up – not fudge, but noticeably thicker than my chocolate syrup usually is. Hubby suggested it as an ice cream topping or something. It is thicker, fudgier. However it still dissolved in heated up milk. It took more effort than the unbolided mix. Big Brother said it tasted “fine” but then did not finish all 4 oz. so I can’t fully tell. So I will use the rest of the practice batch and then decide. Next time I want to dissolve the protein power into the water before I add the cocoa – rather than 2nd to see if that will dissolve the protein power better.